for the longest time i’ve seen the covers to the books in this series and had been on the fence about reading them. Well, i finally decided that it was about time and I’m not quite sure that it was worth the wait. there are a few reasons for this. 1) i’m one of those people that if a books is really good, i’ll read it cover to cover (e-book style) in one night. that didn’t happen here. as a matter of fact it took me maybe 3-4 days to read it, and it’s partly because i was ‘ok’ with putting it down, and partly because well…life just kind of got in the way last week. Jace is our lead guy in this story – he’s a shadow hunter who for some reason keeps creeping up on Clary when she first meets him, and then turns out to be her guide and touch stone for all things super natural. of course there’s a cast of supporting folks, Simon as i mentioned (non-supernatural), Isabelle, Alec and Hodge (super natural), Valentine (so not romantic and sweet- VERY EVIL) and well…the list goes on and on. I’m kind of at a lost now of what to expect of the next story since there were things that i really wanted to see happen in this first book that didn’t but i guess that’s kind of the allure of a decent author right? that you think one thing will happen and then something completely different does. Without giving it away – that’s kind of what happened here. 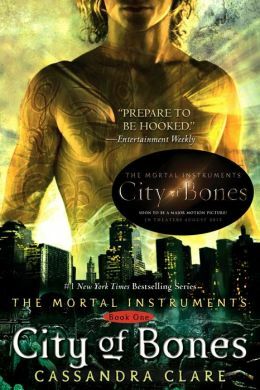 This entry was posted in Uncategorized and tagged Cassandra Clare, City of Bones, Clary, Demons, Shadowhunter, The Mortal Instruments Series by iscm13. Bookmark the permalink.